With summer sitting right around the corner, now is the best time to swing by Bama Buggies and pick up one of our E-Z-GO brand golf carts. If you’ve never considered purchasing one for yourself, here are four reasons why it might be the right decision for you. If you’re an ardent, dedicated golfer, why not bypass the rental fees and zip around your favorite course in your own, personalized cart? Spend less time at the front desk and more time on the green. Plus, if you already live in a golf community, a cart of your own makes the trip all the more enjoyable. Please note, golf courses across the country tend to have different rules regarding personal golf carts. Some allow you to bring your own at will, others provide mandatory on-site storage for personal carts, and some don’t allow it all. Before you purchase a cart for your game, be sure to check with your course’s rules. It doesn’t matter how old you are, there’s simply no denying that golf carts are fun. 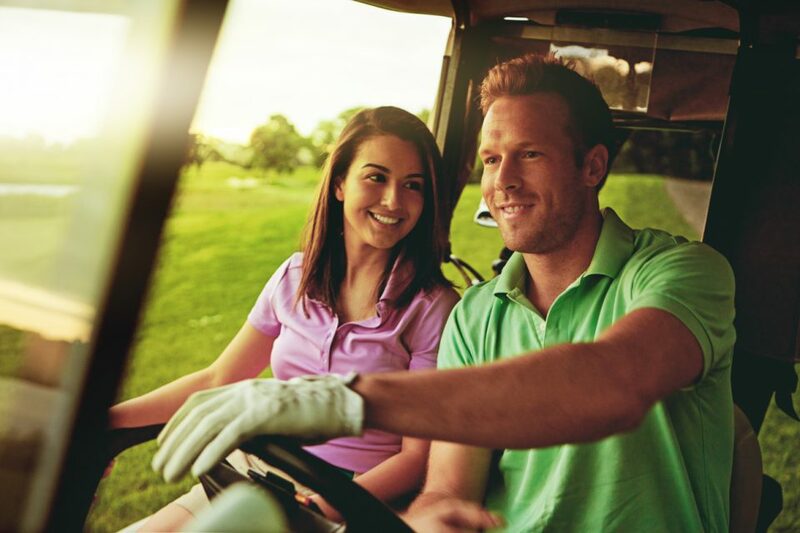 Whether you’re cruising around the neighborhood or a local park, E-Z-GO golf carts provide a safe, inexpensive option for a leisurely joy ride this summer. They also make a simple way to travel around your community without having to get in your car (where feasible, of course). The E-Z-GO golf cart doesn’t have to be all about fun and games. It can be a useful work vehicle as well. Many businesses associated with the outdoors – such as Parks & Rec departments, stables & farms, country clubs, retirement communities – will find plenty of benefits in having an E-Z-GO on hand. They also make for great shuttles as outdoor festivals, concerts, and sporting events. If you’re the type that likes to spend your summers camping, hiking, & fishing, then an E-Z-GO golf cart might be the extra boost your outdoor adventuring needs. Golf carts give nature lovers a non-invasive companion for traveling to and from campsites and trails, as well as an easier way to carry your equipment. Just remember, if you plan to traverse some rougher terrain, you might want to consider a UTV or ATV instead. If you’re ready to swing for your own E-Z-GO, come by Bama Buggies on Skyland Blvd today and check out our selection of electric, gas, and elite carts. We’ve got brand newer models, as well as used and marked-down models in stock. As the long-standing leader in golf cart innovation, you simply can’t go wrong with an E-Z-GO. Contact us today to get a quote or to learn about our great financing options. Or, come down to the store and take one for a spin yourself!